Fresh snow dusted the steel rails of the abandoned track. Christmas was just two weeks off and the surrounding fields were already painted a cold white. That thin blanket helped preserve the first bit of evidence of a gruesome crime. Three sets of footprints left their mark in the snow up the lonely track to the spot where a bullet-riddled corpse lay stretched across the rails. The body, hit with five bullets, was dressed in a snappy monogrammed blazer, accessorized by expensive gold chains and rings. Draped across one of the rails, arms splayed out wide, the frozen corpse looked like an oak felled by a woodchopper’s axe. Red splotches dotted the snow. It was about 10 a.m. on Saturday, Dec. 10, 1983 when a GO bus rumbled along Derry Road in Milton, past the spot where Highway 407 now crosses. 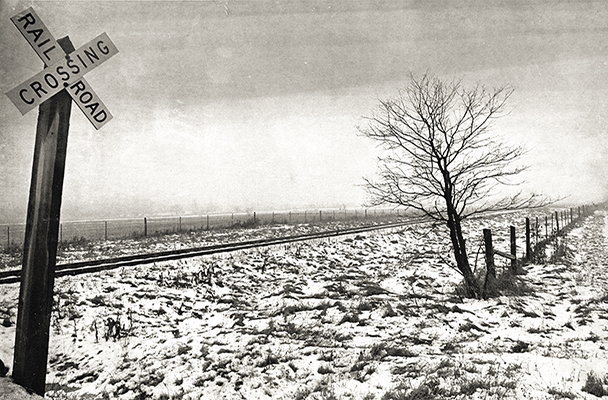 Frank Lippai stared out the bus window at the snow-covered countryside. Lippai, a young musician, was on his way home from Toronto. As the bus passed Ninth Line then crossed an abandoned railway spur, Lippai did a double take. About 30 metres up the line, there appeared to be a body sprawled across the track. When the bus arrived at the Milton GO station a few minutes later, Lippai called police. “I wasn’t even certain it was a body,” he would say later. Halton police arrived at the rail line shortly after. The footprints that didn’t walk away were easy enough to figure out. They belonged to Domenic Racco, a volatile 32-year-old Toronto bakery owner and mobster-in-training. In the early hours of the morning, he had been shot three times in the head and twice in the chest with a .38-calibre revolver. Almost immediately, it was declared by police as a mob hit related to a debt Racco owed to another crime family. The people who made the two sets of footprints that walked away from the body that night? It has been 31 years since Racco was murdered and, technically speaking, the killing remains unsolved. But certainly not for a lack of trying. Six men across two separate trials have been charged with Racco’s murder and six men have been convicted and sent to prison, yet none of the murder charges have stuck. In the first trial, the four most likely suspects, including two brothers at the head of Hamilton’s Musitano crime family, were charged with first-degree murder, then allowed to plead guilty to lesser charges in connection with Racco’s death, despite plenty of incriminating evidence against them. Then, six years later, there was a bombshell announcement. Two other Hamilton men — Dennis Monaghan and Graham Court, a couple of low-level enforcers for the Musitanos — were charged with first-degree murder in Racco’s death, even though neither man had been considered a suspect in the original case. The new evidence against them was provided by a Hamilton drug trafficker who had agreed to act as a police informant to escape serious charges he was facing. The deal was only valid, however, if the information he provided led to a conviction. On Nov. 18, 1991, Monaghan and Court were each convicted of first-degree murder for killing Racco and sentenced to life in prison, based largely on evidence collected from recorded conversations involving the informant. Once again, the case was apparently closed. And it likely would have stayed that way if it wasn’t for one loose thread, one niggling detail that couldn’t be explained away. Among the many tapped phone calls and secretly recorded conversations involving the informant, one was conspicuous by its absence. Police should have had a tape that was recorded on the night of Nov. 29, 1989 in an abandoned doughnut shop in Hamilton’s east end. In it, Monaghan claims he adamantly denied having any involvement in Racco’s killing. That tape, which could have helped exonerate Monaghan from the start, was never turned over to his lawyer. What’s worse, the lawyer had been led to believe by police the tape existed and contained no such denial by Monaghan. In fact, it turns out police never listened to the tape from the doughnut shop. It was never transcribed, never even found by police. To this day, its whereabouts remain unknown, if it existed at all. The missing tape became the grounds for an appeal and, in 1995, Ontario’s Court of Appeal ordered a new trial for Monaghan and Court. The retrial landed in the lap of Justice Stephen Glithero, a veteran judge with an excellent reputation. As the new trial of Court and Monaghan unfolded, Glithero was horrified to discover the questionable tactics police and the Crown had used in their quest to obtain convictions against Court and Monaghan. Glithero eventually halted the trial and conducted his own investigation into what had happened, dating back to the first trial involving Court and Monaghan. The judge discovered the missing tape containing Monaghan’s denial was just the tip of the iceberg. Glithero itemized 17 different instances of nondisclosure of evidence by police and the Crown. Six of those 17 instances involved tapes of interviews that were either lost or missing. The evidence not disclosed to the defence had explosive implications. Monaghan and Court’s lawyers were never told another man had already confessed to killing Racco. They never learned police had collected physical evidence and conducted interviews with jailed informants that should have exonerated the two men. “I have found deliberate nondisclosure or suppression of virtually every piece of evidence that was of probable assistance to the defence,” Glithero wrote. In a long, blistering decision, the judge concluded it would be impossible for Court and Monaghan to receive a fair trial. He placed the blame squarely on the shoulders of the police and Crown attorney. “I have found many instances of abusive conduct by state officials, involving deliberate nondisclosure, deliberate editing of useful information, negligent breach of the duty to maintain original evidence, improper cross-examination and jury addresses during the first trial,” Glithero stated. “The fair trial interests of both men have been thwarted by state agents,” Glithero added. The words “deliberate” and “abusive” were used repeatedly throughout Glithero’s decision. In June 1997, Glithero ordered a stay of the first-degree murder charges against Court and Monaghan. Almost immediately, the Crown announced it would not appeal the decision. Yet again, the case was closed. Monaghan walked free after seven years in prison. Nearly a decade ago, he reached an out-of-court settlement related to his case, the terms of which can’t be disclosed. He had come to Canada from England as a five-year-old boy with landed immigrant status. Once the charges were stayed, Court was deported to England, where he has remained for the past 17 years, in a small town between London and Oxford. Within a month of Glithero’s stinging rebuke, the Hamilton and Halton police forces, which had worked together on the Racco homicide case, jointly approached the Ontario Provincial Police and asked it to conduct an independent investigation of the police and the Crown, with respect to the judge’s concerns. It was to be a criminal investigation, meaning that charges could have flowed from the OPP’s findings. “Project No Show,” as the investigation was dubbed, began in August 1997 and concluded at the end of February 1998. There was no explanation of the findings and no explanation why charges were not warranted against the police and the Crown. Surely this would close the case once and for all. But the short OPP press release was preceded by a 318-page report on the investigation, key sections of which have been kept secret since 1998. For the past 16 years, in a fight that has gone as high as the Supreme Court of Canada, Ontario’s Ministry of Community Safety and Correctional Services has successfully kept the full Project No Show report from being made public. The Spectator has obtained an unredacted version of the entire OPP report. For the first time, details from the long-secret document can now be revealed, including the names of witnesses and events in the Racco murder that have never been made public. The 318 pages reveal an OPP investigation that was shockingly superficial and almost comically inept. In one interview, the Halton police force was misidentified as Haldimand, and the date for another interview didn’t have the correct year. Two OPP investigators travelled to Florida to conduct a 26-minute interview with a retired Hamilton police officer. And, in the ultimate irony for an investigation prompted by a missing tape, an interview with one police officer had to be redone because the tape recording from the first interview turned out to be blank. Eleven people were interviewed by the OPP — nine police personnel from the Hamilton and Halton forces and two Crown attorneys. The combined time of the 11 interviews amounted to less than seven hours in total for a criminal investigation that spanned seven months. The OPP investigators never interviewed Court and Monaghan about what had happened to them, and there’s no evidence in the report the OPP contacted their defence lawyers to get their sides of the story. Transcripts show the interviews with police officers are filled with softball questions and leading statements by the OPP investigators. In some cases, the OPP investigators would finish the sentences for the officers being questioned. The entry pertaining to the Crown attorney who prosecuted Court and Monaghan in 1991 consisted of him providing a short prepared statement with no indication he answered any questions from the OPP. He then declined to sign his own statement. Glithero cited 17 distinct and serious instances of nondisclosure by the police and the Crown, yet the OPP’s investigation focused almost exclusively on just one issue: What happened to the missing tape of Monaghan’s denial of his involvement in the Racco murder? In fact, the one-page summary of the investigation contained in the OPP report deals only with the missing tape, ignoring the other 16 issues of nondisclosure. After seven months of inquiry, interviews with 11 people and a 318-page report, the OPP’s investigation came up with just one new conclusion about the only issue that was explored. “In essence, it has never been established that the tapes made from the doughnut shop that evening ever recorded,” the report states. Here, for the first time, is the complete story about a dead mobster on a train track and the two Hamilton men who were railroaded for his murder.